Level 8 Craftling: Hide Your Litter Box! Litter boxes are ugly. Instead of having a container full of grey 'sand' filled with cat dung sitting in the corner of your room, now you have an enclosed wooden cupboard. It looks much better. You have more vertical space - you can place things on top of the litter box furniture. You are sacrificing some horizontal floor space (it takes up more floor space than the original litter box), but this makes up for that. The most pressing reason: you no longer have litter EVERYWHERE. The litter mostly stays in the litter box furniture. No more daily sweeping and vacuuming and apologizing to guests for getting pieces of litter stuck to the bottoms of their feet as they walk around. This is the main reason I made these, and the results are fabulous. I was first inspired by this piece of litter box furniture by Out of Sight Litter Box, a small company that does all of its manufacturing in the US. If you have the money, purchase from them! I'm very much in favor of supporting local small businesses (as I am one, haha). If you're more on a shoestring budget like me, read on to see how I made my own. I made both of these by starting with what I could find - similar to how I made the cat tower, in that respect. I went to the Ann Arbor ReUse Center, a fabulous thrift store that sells old furniture (amongst other things). Before I went, I measured how big my litter box was, and put my cat in it and measured how high a space they needed to comfortably use the litter box. I needed a piece of furniture that could have the horizontal space to fit my litter box and a couple steps, and the vertical space to hold the litter box shelf and another shelf, too. I'll show you what I found and how it worked! I forgot to take a photo of this before I made it, but when I started it was a simple four-sided open cabinet. It didn't have any of the shelves or the door, essentially. I believe it was originally meant for electronics, because there are two big round holes in the sides near the back (you can see a dark spot in the lower back corner - it's a hole). The cats walk in the bottom level, which has a latchhook rug I made to catch all the stray litter. They then walk up the two little steps I made in the back. And - tada! - there's a litter box on the top shelf! This is kept closed, except for when I need to open it to clean the litter box. To make this, I used spare scrap wood I had to make the shelf the litter box sits on, the two steps, and the door (which is why the door is made from two pieces). There are two latches holding the door shut. I used random wood stain I had to try and stain the front piece to be similar in color to the rest of it (it doesn't match exactly, but it's close enough to not look wildly different at a glance). I also added the little ledge in the front of the bottom shelf, so that the rug can't slide out. To try and get the cats used to it, I played with them on it for a while. I left the litter box out and the door open, and used the laser pointer to make them walk up and down between the two levels (the stairway is snug, but they fit just fine). There are two ways that this makes less litter spray around your home. First, the litter box is enclosed on all sides, so any litter that sprays when the cats jump out of the litter box stays in the litter box/surrounding enclosure. Second, the long way over a rug that the cats have to traverse in order to get out makes most of the litter fall off their paws before they reach the floor. The amount of litter in my living room DRASTICALLY lessened once I had this in place. Word of warning, though: I thought this was a complete failure for months. I kid you not about months. One of my cats used it maybe twice in the first couple days, checking it out. Then they didn't use it. At all. I checked every few days, then couple weeks, for a loooooong time, and nothin'. I wrote it off as a good experiment, and figured I'd try and sell it on Craigslist or something (maybe someone else's cats were used to tight spaces and would use it). I didn't get around to doing that, and many months after building it I noticed a funny smell coming from it - it was being used! For quite a while I only cleaned it once every week or two (unlike every day or two for the other litter boxes) as it wasn't being used as heavily, but it's use has been increasing with time. The first picture was taken January of 2013, so it's been a little over a year now (wow, time passes), and they use it regularly. My advice: Only change one of your litter boxes to being in litter furniture at first, and give your cats lots of time to adjust. While they are adjusting, they can still use the other litter boxes in the house. Cost: $10 for the cabinet, $4.79 for the door clasps, $16.58 for L-brackets, $3 for nails, $5 for back of latchhook rug = $40 total. Having the living room clear of litter was fantastic, but I still was sweeping my kitchen daily to get rid of the litter there. Last week, I finally built another litter box cabinet for the kitchen litter box. It took going to the ReUse Center several times (2 or 3?) a few weeks apart to find an appropriate piece of furniture. Then - bingo! This beauty was there! It's a simple cabinet with doors that open and one movable shelf (sitting on top of the cabinet when I remembered to take photos before I changed anything!). Here's Gnome checking it out. You can also see a tiny black door-stopper in the middle of the top. The other one is the black thing on the floor in the back corner - I ended up having to superglue it in, as the screw hole was degraded. Superglue for the win! You can see the markings I made on the top and the shelf before I cut them. They were cut with a handheld jigsaw. First, I took the biggest bit on my power drill and made a hole with the edge just touching the black line. That made a hole that I could fit the jigsaw through, and use the jigsaw to cut around the edges I marked out. Then I sanded everything very smooth. In this next picture, you can see a bit of the mess I made on the floor when figuring out how to carpet it. I tried first to use the leftover carpet remnants I had from making the cat tower, but I wasn't satisfied with the raw edges. I wanted this to look nicer than that. But I had recently been to the ReStore to pick up a used microwave, and I remembered that they had small carpets for $3 each! I measured the top of the cabinet and went to find them. The width was perfect! The length was about 4 inches too short. My solution: I got three of the rugs that matched (I picked them out for the shaggiest carpet - the longer threads will pick up the stray litter better) and cut them so they fit together into two rugs of the right size. I cut the end off one of them, and then cut the end off another one with another 4 inches on it, and put them together. I held them together with duct tape. I didn't bother getting special carpeting tape, since the carpet pieces were going to be glued and stapled to the wood cabinet anyway. To cut the holes out of them, I laid the carpet pieces over the top on their shelf and traced the hole with a marker from beneath and cut with big scissors. After pulling at the edges to clean them off loose threads, I smeared wood glue over the back of the carpet and then used my staple gun to adhere them to the surface. The green piece is the one that had been in front of the litter box in the kitchen. I just threw in on the bottom shelf just in case it would be useful in catching litter. No one will see this layer, so it doesn't matter how pretty it is. My kitchen with the old litter box! It's between the shelving unit and the fridge, on the floor. Ugly green box full of litter and cat dung, sitting in the kitchen. And the kitchen with the new litter box cabinet! It looks so much prettier! The extra litter bin and the Litter Champ (think diaper pail, but for litter) fit on top of it (Litter Champ not pictured there). The cats are very curious as to what has been done to their litter box. So far, they've used it a few times in the past few days. Their use of this litter box (which was their favorite) has gone down, but I expect it will probably rebound with time. I'll let you know if it somehow fails. The only concern I have is that I've never caught Kobold using the first litter box cabinet in the living room (though I've seen Gnome use it a handful of times - it's been used far more times than I've seen them use it), so I'm wondering how much he'll like this one. He has already been in it a couple times, though, so I'm hopeful. 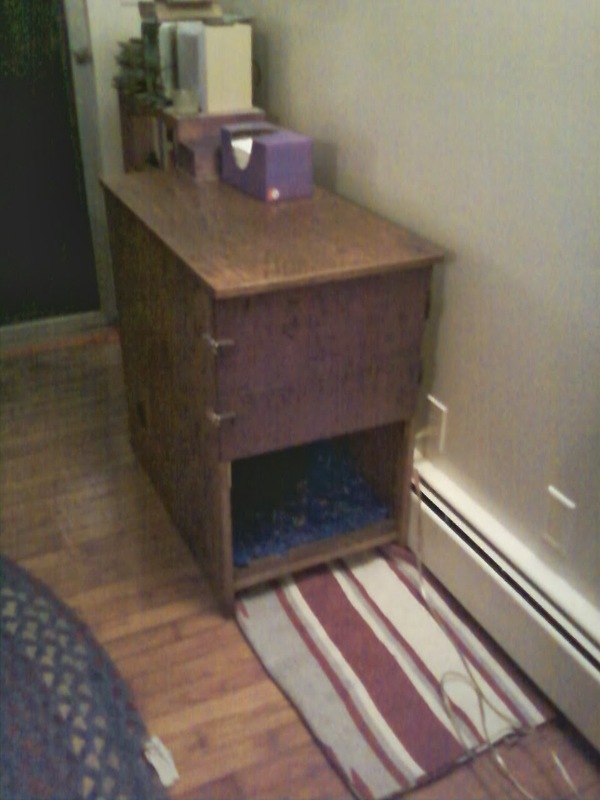 Cost: $15 for the used cabinet, $9 for the three small carpets, ~$2 in sales tax and staples and wood glue, etc. So about $26. My kitchen is so much cleaner now. The floor has a tiny amount of litter on it, but nothing that's really noticeable so far. It's amazing. And it looks so, so, so much better without the open litter box. Wow. Now all that is left is the litter box in the bedroom, if this one continues to work well in a couple months.